Piankusol,with its 200 years' experience in the Thai Silk and Cotton industry of the Northern Thai handicraft capital,provides only the highest quality silk,cotton fabric for fashion, upholsteries and products.Piankusol's products comprise gifts,accessories, homeward, fashionable products and packaging for all gifts and stationery items. Piankusol has launched a new eco-friendly yet elegant silk product line under the Preeme label. Piankusol cordially you to touch the its products at change Mai , Thailand.the Preeme label. Piankusol cordially you to touch the its products at change Mai , Thailand. Silk worm is a kind of animal, which lives mostly on mulberry leaves. Silk cocoon is formed by a single, fine and beautiful yarn that silk worm in pupac stage gives out to cover its body. Each mature silk worm will produce one yarn through its 2 glands to cover its body, which is called "cocoon". The moth which will come out from the cocoon (by biting) can not fly. Each female moth lays hundreds of egg.So the female worm is usually big and makes long and big cocoon, when male worm is smaller and makes shorter and smaller cocoon. The eggs will hatch by nature and change to black in 10-12 days. The little babies need to be fed with sliced and young mulberry leaves. During their first 4 periods they keep eating. The yellow & mature worms will make cocoons and stay side. They will change to pupae and moth at last. The moths will bite their own cocoons and come out to meet their lover naturally. The female moths will lays eggs for the next generation before they die. In the silk weaving circles of Chiang mai the Piankusol name has been renowned for a long time. Combining quality and exquisite patterns, they make one of the best Thai silk. " Our family has been running our silk weaving business for more than 200 years. My name is Kin gkaew Piankusol and I am 72 years old. I am a third-generation silk trader who grew up in a silk weaving environment, and as far as I can remember I have always been involved with this trade of our. In the beginning my great grand mother was selling silk, which beauty fascinated her. Unfortunately silk did not have a great notoriety in Chiang Mai, and in order to have a sufficient income my great grand mother had to transport her silk to Burma, where it was more fashionable. On her way back she would bring raw silk yarn which she bought there. In those days traveling would take her a long time, days of difficult walking. Much later my mother studied the raw silk fabrication, which took her quite a while to master, but allowed us to create our own raw silk and thus run all the stages of the production. She also opened a shop in Sankampaeng as Thai people recognized that our silk followed intricate and gorgeous patterns and that it lasted, the natural dyeing process lengthening silk life. From that moment on our sales increased in Chiang Mai and we had to search out of the family for new weavers to train, whom we found in neighboring villages. Subsequently we could offer more silk for our customers and keep up with the demand. I was 10 years old during world war II and it was a very difficult time. Cost of living was soaring and goods were very expensive; people just what was of prime importance for survival. During my school holidays I helped my mother in her work,selling silk fabric in Sankampaeng market in the morning. Then we would ride 13 kilometers on bicycle from Sankampaeng to the main market in town, which although a long way was always fun to me. During the post-war period a very large silk scarf would only cost 2 bahts (0.05 US $) and my mother decided to take our silk to Bangkok, because not only we would sell it at higher price but we would also find countless customers over there ,especially we could get more comments for our products in order to improve them . With those comments and our own noticing we gradually learn more about design and technics . My mother and I consequently traveled to Bangkok, during those trips we slowly acquainted oueself and I got such an experience that I had been able to immediately take over our business after my mother passed away. 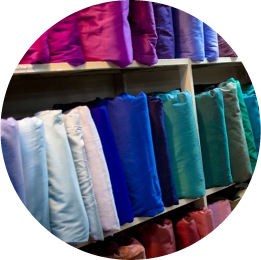 Nowadays our silk sells well because we can cover a wide range of different products, including daytime and night time clothes.